I have always been a bee lover. When Camden was first learning to talk, he used to call bees "Bum-bums," which solidified my love of bees even more (I also believe that they should just be called that now). Tim and I have had a long term dream of having our own bees and even took a bee keeping class a few years ago! Our full bee keeper suits are waiting patiently in the closet for the day that we will finally have our own colony. Hopefully that day will arrive soon, but this bee unit seemed like a good way to introduce Camden to our favorite insects in the mean time. 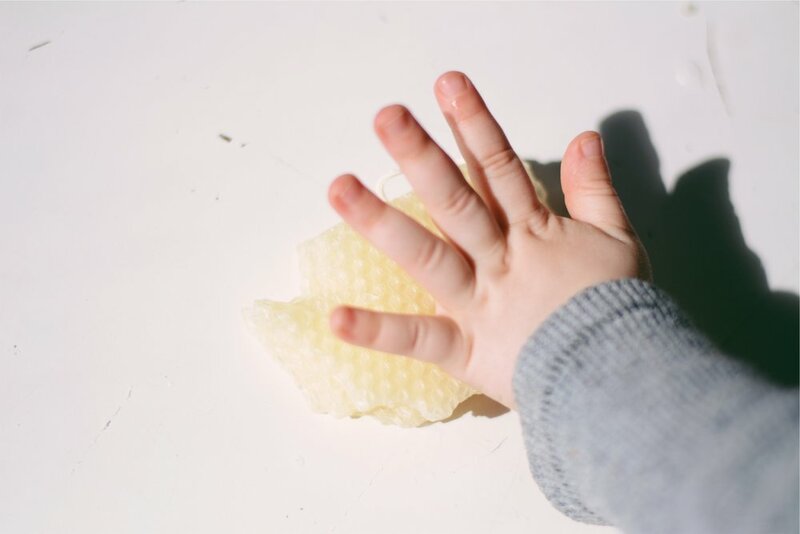 For some other truly lovely ideas for a toddler bee discovery check out my dear friend Lindsay's post on her blog This Merry Montessori. It was so fun for Camden and Eli to work on bees at the same time! I can't wait for the day that they can work in the same room. Camden has been very interested in gestation of all types since my belly started getting bigger with Baby 2. He asks if our dogs were in their mommy's belly and has extended the question to chickens, bugs and even cars! This bee life cycle, along with matching cards that we found at Susie's Home Education Ideas, were the perfect introduction to the lifecycle of a bee. I initially laid the cards out in order and discussed the phases while Camden matched the objects to the cards. After discussing it together, Camden was able to correctly align the lifecycle, name the phases and match the insects to the cards. The Montessori Company has absolutely gorgeous Parts of a Bee cards that I printed and laminated for Camden. I paired them with the bee from the bee lifecycle so that Camden could point out the parts on an actual bee. This is the first time we have used "Parts of..." cards. I first started by introducing each part. Then I pointed the highlighted part on the bee and showed Camden the corresponding part on his bee. Camden quickly advanced to pointing them out on his own and then to naming them independently. He has been carrying the bee with him everywhere he goes this week. While we were in the grocery store earlier this week, a nice older lady told Camden to be careful not get stung by the bee he was holding. Camden looked at her and said "This bee won't sting me. There is no stinger on the abdomen!" Haha! 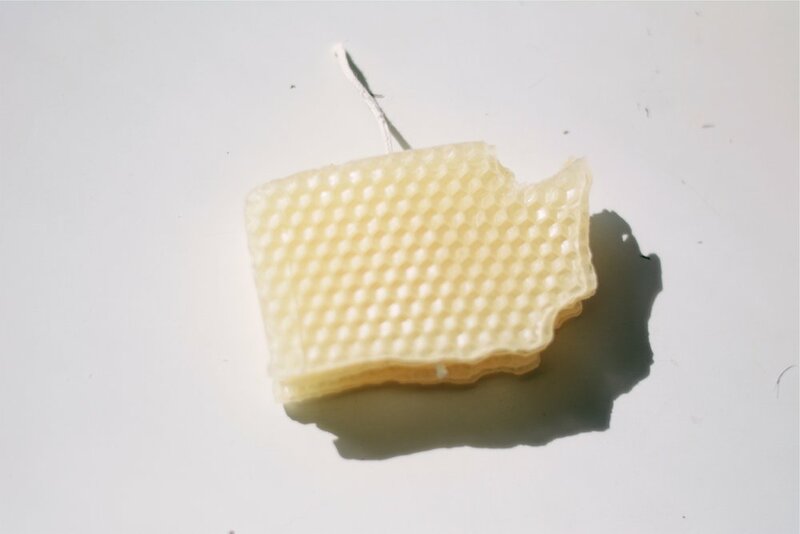 I found this bee preserved in acrylic and presented this on a tray with a magnifying glass. Camden has really enjoyed observing textures with his new magnifying glass and really enjoyed getting to see a real bee up close. He has been really into "I Spy" recently, so we played a game where I would pick up one of the Parts of a Bee cards and say "I spy the thorax" and Camden would happily hunt for it using his magnifying glass. I wanted Camden to make a real life connection with products that we use that come from bees. He has been so interested in scrubbing recently, that I thought it would be a good time to introduce polishing. 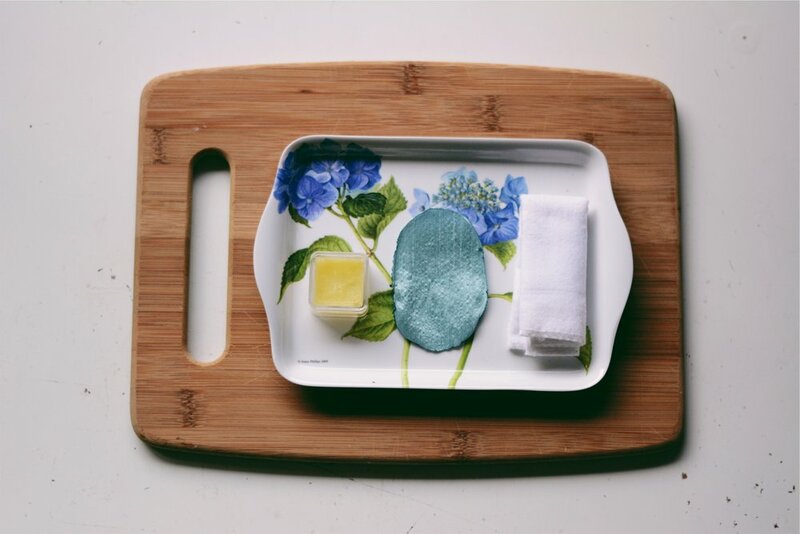 I used this lovely beeswax polish and a bamboo cutting board from our kitchen. I transferred the polish to a small container to limit the amount of polish that Camden could use at one time. I also provided two cloths, out of different materials to help discriminate the different tasks for the cloth. First, he spread wax on with the blue microfiber cloth. I pointed out how the wax caused the wood to change colors. Then he wiped the excess wax off with a soft white cloth (that was actually a shoe shining mitt from a hotel we stayed at not long ago.) This was an easy tray to set up and has been chosen by Camden a couple of times a day. All of my bamboo cutting boards have gotten a nice refinishing! Camden has a great fondness for candles... well for blowing them out anyway. I initially was going to try to have him roll some tapers, but he definitely isn't ready to do that independently. Luckily, I realized that he could stamp out shapes with a cookie cutter and we could layer them to make a candle using this kit and cookie cutters! He was able to do 90% of the work himself, the only parts he needed help with were placing the wick and heating up the wax to make it easier to cut. Initially, I was using a blow dryer to heat the wax up a bit, but then I realized that leaving the tray in the sun was enough to make the wax soft enough to cut. First, Camden cut out 6 pieces using his Washington state cookie cutter (we've had good luck with a gingerbread man and a star as well, if you don't have an awesome cookie cutter for your state.) Then he layered the pieces on top of each other. He has really enjoyed matching shapes recently, so this was his favorite part. I laid the wick after he put down three pieces and then he laid the last three and pressed firmly to squish them together. This was a multi-step task that requires more involvement from me than I typically present, but he loves this so much that we already have six candles and counting! One of the very best parts about doing a bee unit is getting to do a honey tasting! I put together three types of honey with different textures and appearances: wildflower, raw and honeycomb. (Note: honey tasting is not recommended for children under the age of one.) I presented them on a tray to try individually, but have also presented the raw honey to spread on crackers with a small knife. Camden is absolutely crazy about the honeycomb. The honeycomb that I purchased was actually built directly into the container by bees. Camden was so excited about this that he told almost everyone he met that day that he "ate honeycomb in a box and BEES put the honey in there! I ate the wax too!" I think it was wonderful for him to see real honeycomb so he could see the honey oozing out and make a connection about where our honey comes from. Camden was incredibly interested in the different materials that bees produce or eat. While reading the bee books listed below Camden kept asking me what pollen was or what honey looked like. We bought some lilies and observed the pollen on the stamen. I also decided to put some small acrylic boxes with the different materials on his shelves as a matching exercise with cards. Having the pollen loose in a box helped him see how it could stick to the bees legs. I included the wildflower honey, raw honey, honeycomb, wax and pollen. My favorite way to tie together a discovery like this is with books. 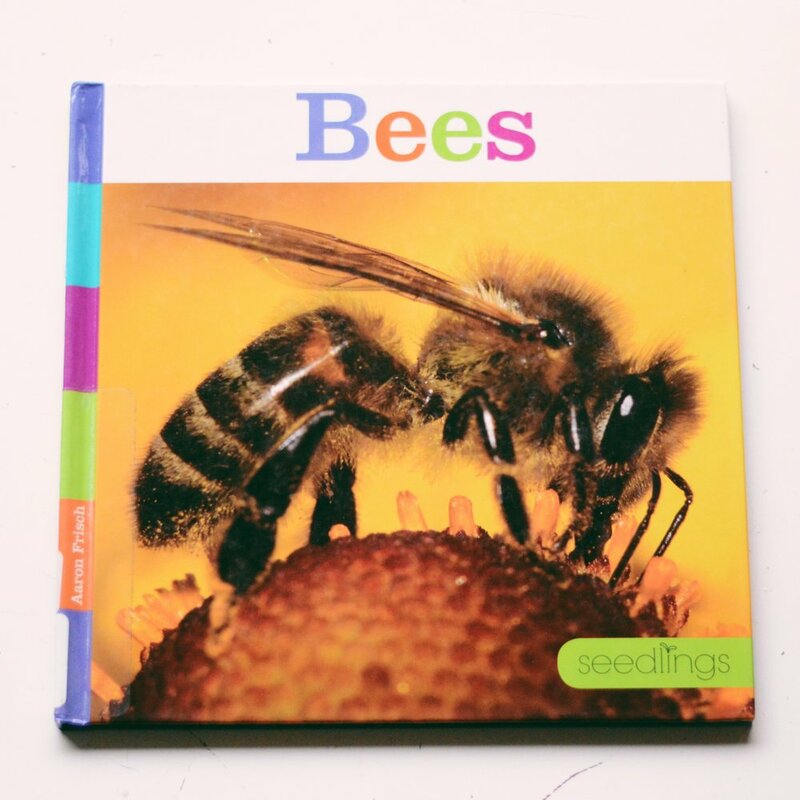 Many times Camden would run to his shelf to grab some wax to match to the image in the book or pick up the bee to buzz around over a flower. Here are some of the books that Camden enjoyed reading most: Bee Life, Bees, Amazing Bees, and Bees. Camden had so much fun with this bee discovery! I can't wait for the weather to get warm enough for him to see some bees in action this spring :-).